Galleria Federica Schiavo is proud to present the first solo exhibition of the Italian, Rome-based artist Carlo Gabriele Tribbioli. 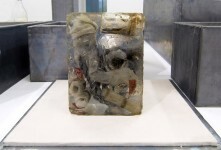 Titled with poetic hyperbole, Reperti per il prossimo milione di anni, is the fruit of a long term project, which the artist pursued principally from 2007 to 2009. 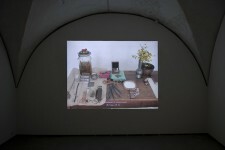 To say that the exhibition features everything from performance, photography, drawing, video, sculpture and installation seems somehow beside the point, or secondary to the complexity and density of Tribbioli’s overall enterprise. 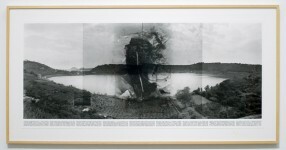 As much about attempting to create a myth and ritual of a markedly existential nature as it is about process, documentation, and fashioning a methodology, Tribbioli’s Reperti per il prossimo milione di anni is a cogent contemporary example of what Harald Szeemann celebrated as ‘individual mythology.’ Even if Tribbioli’s frame of reference extends well beyond the personal to the classical, it is nevertheless strongly reminiscent of Szeemann’s celebration of the creation of a complete, ideally self-sufficient universe of reference and signification in which to read the work. Initially interested in questions of time and its so-called irreversibility, the possibility of duping archeologists of the future, and the classical notion of an eternal present, Tribbioli pursued these ideas as he saw them partially embodied in Lake Averno, north of Naples. Once the site of the divinatory cult of the Sibilla (the colony of Cuma was founded in 740 bc), who conceived the body of water and its surroundings as an entrance to the netherworld, the now virtually anonymous lake can but testify to its own lack sacredness, as a place of secular profanity. Fascinated by the progression from the sacred to the profane and the lack this entails, Tribbioli sought to transform it into the site of a new mystery, whose evocation might similarly summon up the possible existence of an erstwhile cult for archeologists a thousand years from now. 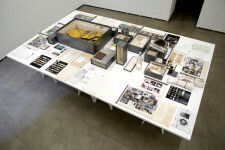 Akin to the majority of Tribbioli’s practice, the following process and rite assumed absurdly epic proportions, including everything from a performance in which the artist lay on a table without moving for twenty four hours to the systematic gathering of objects and detritus while circumnavigating the perimeter of the lacustrine body. 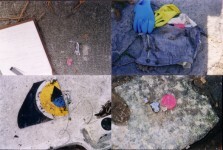 The three years of research and reflection that went into this project were ultimately distilled into what the artist calls Il Grande Corpo Solido (an elaborate time-capsule encasing various samples and fragments of his process cast in resin), which he ceremoniously deposited in the center of the lake. Paralleling the present day absence of the ancient cult, Il Grande Corpo Solido, and the oblivion to which it was delivered is crucial to Tribbioli’s entire operation by virtue not only of its elision of the “contemporary” but more importantly, of its future destiny as a mystery. 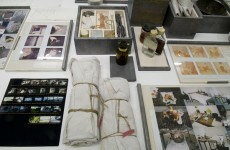 Meticulously and exhaustively documenting every step of the thinking and production of Il Grande Corpo Solido in notes, photography, drawing and video, Tribbioli trained an all but scientific eye on his own process, taking the notion of documentation to its pathological breaking point. 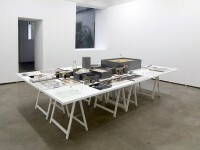 Accordingly, the exhibition consists of a marvelous and highly considered profusion of material, which is presented in three parts: the documentation room, a video about the process, and lastly an image, which seeks to distill the entire project into a juxtaposition of Il Grande Corpo Solido and the lake. 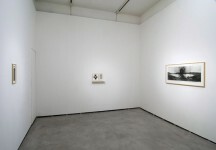 The exhibition asks at once to be scrutinized and deciphered, while overwhelming the viewer with the manifest insurmountability of such an undertaking. Suspecting that the creation of a modern myth will never be a match for the myths engendered and embraced by the ancients, Tribbioli, whose education is grounded in philosophy and classicism, nevertheless pursues his forlorn objective with other objectives in mind. His practice is shaped by an existential ethic, which is itself driven by a patent jusqu’au-boutisme. 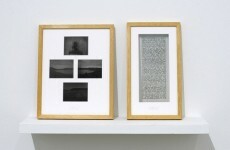 If ever the work, with its emphasis on analogue processes, from photography to typewritten texts, veers toward anachronism, it does so deliberately. Contrary to the contemporary condition of rapid and distracted consumption, the work and the various media which it uses internally betray and promote a total absorption in its subject, a bewildering attention to detail, and an overall slowness. Thus is its ethic embedded its very methodology, process and presentation.